Three days after winning the 1500m title, Caster Semenya stormed to another Commonwealth Games record-breaking victory, completing a middle-distance double with 800m gold on the Gold Coast. Despite it being her fourth race in five days, the South African world and Olympic champion dominated the two-lap final and clocked 1:56.68 to improve on the Games record which had been set by Joanna Houareau in 2002. Kenya’s Margaret Wambui claimed the silver in 1:58.07 and Jamaica’s Natoya Goule the bronze in a 1:58.82 PB, as England’s Alex Bell finished fifth. 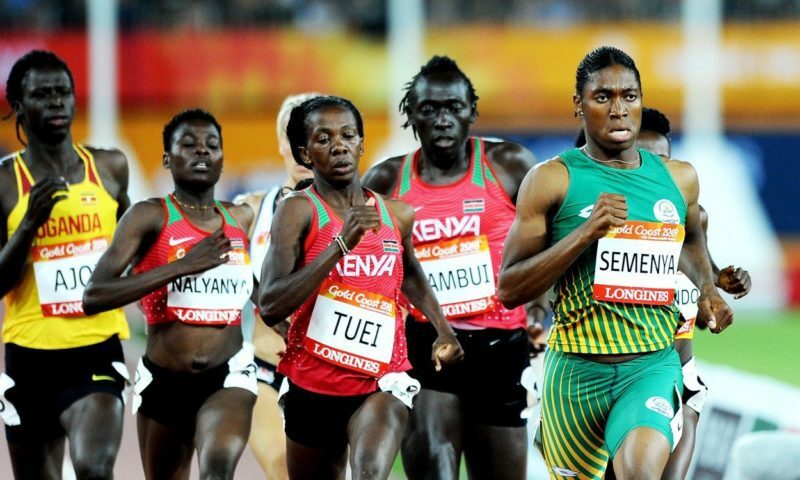 “Being able to win the double is a memory I’ll never forget but I’m doing this for the youth to show them that anything is possible, if you believe,” said Semenya, who is the third athlete after Wales’ Kirsty Wade in 1986 and Kenya’s Nancy Langat in 2010 to win both the 800m and 1500m at the same Games. “Today was all about being in command and running your own race,” she added. Bell was delighted with her two two-minute runs back-to-back, her time of 2:00.83 in the final following a 2:00.11 PB in her heat. “It took me all season last year just to run one (two-minute 800m), so to do so at this point in the season is great. It gives me so much confidence competing against a world-class field, I’m really looking forward to what the season holds.